A two-year community planning effort involving a diverse group of residents, property owners, and business representatives, Realize Rosslyn culminated in a comprehensive vision and plan to transform this economic hub of the County into a more walkable, dynamic, live-work-shop-play urban center and vibrant gateway to Arlington. 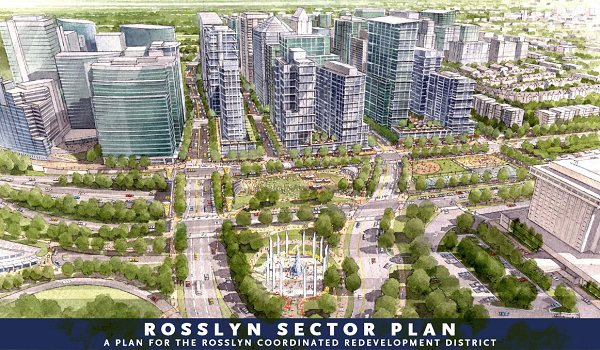 On July 23, 2015, the County Board unanimously voted to adopt the Rosslyn Sector Plan. At the Virginia APA chapter's annual conference in July 2017, the County was honored for their work on the Rosslyn Sector Plan with the Holzheimer Award for Economic Development. Find out more about implementation. The 25-year plan provides both a vision and a guide to growth and development in the Rosslyn Coordinated Redevelopment District (RCRD). Fostering a more balanced mix of land uses with more housing and continued high-density development to support a varied and intensive mix of people and activities. Realize Rosslyn kicked off in 2012 as the first in-depth review of planning in Rosslyn in 20 years. From public workshops, events, and one-on-one meetings to social media and virtual forums, the community worked together in a variety of ways to influence the vision of Rosslyn's future. Learn more about the Realize Rosslyn process, scope and timeline. All project documents are available online including agendas, meeting notes, presentations, archive news, background materials, and the Rosslyn Plan Framework. On Oct. 15, 2016, the County Board approved amendments to the General Land Use Plan, Master Transportation Plan and Zoning Ordinance to implement the vision of the Rosslyn Sector Plan. Learn more about the amendments.